Order now from Amazon, iTunes, and all major retailers and digital outlets. 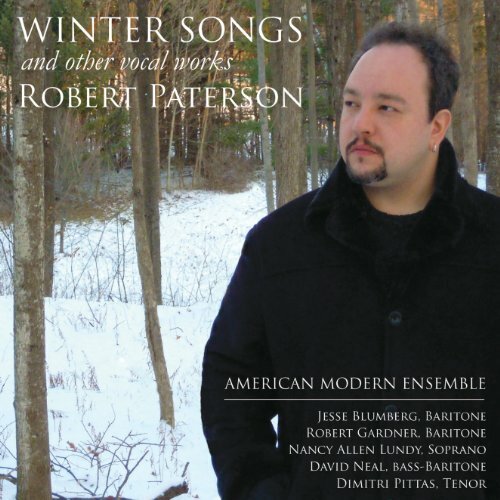 Winter Songs is the first album dedicated entirely to the vocal music of award-winning composer Robert Paterson. All works on the album are performed by the New York City based American Modern Ensemble and produced by multi-Grammy winning producer Adam Abeshouse. Each work features combinations of voice, flute, clarinet, violin, cello, piano and percussion. The featured vocalists are some of the finest in North America, including Jesse Blumberg, Robert Gardner, Nancy Allen Lundy, David Neal and Dimitri Pittas. All of the works on the album are world premiere recordings. The works on this album are inspired by a variety of diverse subjects, and in many cases, use unconventional texts. CAPTCHA, sung by Jesse Blumberg, is the first work on the album for tenor and piano, and uses reCAPTCHA texts for each movement. CAPTCHA stands for Completely Automated Public Turing test to tell Computers and Humans Apart, and CAPTCHAs (or in this case, reCAPTCHAs) consist of combinations or real words and gibberish words. Selected reCAPTCHA texts were used for all of the movements. Winter Songs for bass-baritone and chamber ensemble consists of settings of winter-themed poems by A. R. Ammons, Billy Collins, Robert Creeley, Wallace Stevens and Richard Wilbur, and ls sung by David Neal. Eating Variations (sung by Robert Gardner) is scored for baritone and chamber ensemble, and is a setting of poems by New York City-based poet Ron Singer, and is a sendup on food faddism. The texts for Thursday for soprano and piano consist of fictitious answering machine messages and is sung by Nancy Allen Lundy. Batter's Box for tenor and piano is a series of texts inspired by legendary New York Mets baseball catcher Mike Piazza, and is sung by Dimitri Pittas. In 2012-13 AME was the ensemble-in-residence at the CUNY Graduate Center in New York City, and AME tours and offers educational outreach programs. Recent collaborations include the Dance Theater of Harlem and Talujon percussion ensemble. Thursday - 2. 9:15 a.m.
Thursday - 3. 10:42 a.m.
Thursday - 4. 5:09 p.m.
Thursday - 5. 6:05 p.m.
Thursday - 6. 6:15 p.m.